The Syrian Arab Army (SAA) has been engaging in clashes with militants of Al Nusra, Ahrar Al-Sham and the Turkmen Islamic Party in the northern part of Latakia province. The main clashes are ongoing for areas in Jabal Al-Akrad where militants had launched to advance on the positions of pro-government forces earlier this week. Near Aleppo city, joint forces of Al Nusra and Nouriddeen Al-Zinki successfully advanced on the SAA positions in the Malaah Farms pushing pro-government forces from the northern part of the farms. SAA units, located there, withdrew to the Handarat Mountains in order to regroup and prepare fresh operations in the area. The Kurdish-led Syrian Democratic Forces, helped by US Special Forces and supported by the US-led coalition air power, are advancing in the ISIS-controlled city of Manbij in Aleppo province. Kurdish forces have seized the Madfaa traffic circle near western gates of Manbij, the police traffic building at the M4 Highway and the Assadiyat neighborhood. Clashes are also ongoing in the Hawatima neighborhood. ISIS still controls the most of the city, including areas west and south of Tetbekat Prison. Following the ongoing events, the SDF is likely attempts to separate the eastern and western part of the city in order to cut off various ISIS units and defeat them one after one. On June 29, the US-backed militant group, known as “New Syrian Army”, helped by Western-backed special forces, seized a military airport, the nearby Hamdan village and the village of al-Sukari held by Islamic State militants close to their strategic city of Al-Bukamal near the Syrian-Iraqi border. The NSyA announced the advance on Al-Bukamal, located on the Euphrates River, and engaged in clashes with ISIS militants near the city. However, this advance ended in total disaster for the US-backed group. ISIS fighters reportedly killed 40 NSyA militants and captured 15 others. 6 vehicle-mounted automatic cannons and 6 trucks loaded with ammunition were also captured by ISIS. 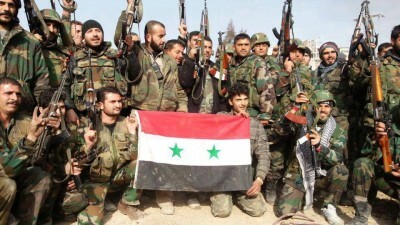 As of June 30th, the NSyA withdrew from the al-Hamadan military airport and the nearby villages. Now, NSyA-linked media sources argue that the group strategically retreated to the desert and the Al-Bukamal was a raid because the group was not pursuing the goal to capture the city.